Charles Willson Peale’s portrait of George Washington, 1776. The backdrop of the geopolitical contest that Blackhawk mentions — the “Great Game” of the Enlightenment, as it were — was the Seven Years’ War (what we in the US sometimes call “The French and Indian War,” though this term can be reserved to refer exclusively to the North American theater of the Seven Years’ War), in which future first President of the United States, George Washington, fought as a major in the militia of the British Province of Virginia. The Seven Years’ War is sometimes called the first global war, as it was fought between a British-led coalition and a French-led coalition across the known world at the time. The Seven Years’ War was the final culmination of imperial conflict between France and the British Empire, and the defeat of the French ultimately led to the triumph of the British Empire and its worldwide extent and command of the seas in the nineteenth century. As an interesting counterfactual, we might consider a world in which the British has triumphed earlier over the French, and had established unquestioned supremacy by the time of the American Revolution. Under these changed circumstances, it would have been even more difficult than it was for the American colonists to defeat the British in the Revolutionary War, and as it was, it was a close-run thing. The colonial forces only won because they fought an ongoing guerrilla campaign against a distant power, which had to project force across the Atlantic Ocean in order to engage with the colonials. Even at the disadvantage of having to send its soldiers overseas, the British won most of the battles of the Revolutionary War, and the colonials triumphed in the end because they wore down British willingness to invest blood and treasure in their erstwhile colony. When the colonials did win a battle, the Battle of Saratoga, the British made a political decision to cut their losses and focus on other lands of their global empire. From the British perspective, the loss of their American colonies was the price to be paid for empire — an empire must choose its battles, and not allow itself to get tied down in a quagmire among hostile natives — and it was the right decision at the time, as the British Empire was to continue to expand for another hundred years or more. With the French out of the way (defeated by the British in the Seven Years’ War, and then further crippled by the Haitian Revolution, as Blackhawk pointed out), and the American colonies abandoned, the British could move on to the real prizes: China and india. The Seven Years’ War was the “big picture” geopolitical context of the American Revolution, and the American Revolution itself triggered the next “big picture” political context for what was to follow, which was the existence of revolutionary republics, and panic on the part of the ruling class of Europe that the revolutionary fervor would spread among their own peoples in a kind of revolutionary contagion. One cannot overemphasize the impact of the revolutionary spirit, which struck visceral fear into the hearts of Enlightenment-era constitutional monarchs much as the revolutionary spirit of communism struck fear into the hearts of enlightened democratic leaders a hundred years later. The revolutionary spirit of one generation became the reactionary spirit of the next generation. Applying this geopolitical rule of thumb to our own age, we would expect that the last revolutionary spirit became reactionary (as certainly did happen with communism), while the revolutionary spirit of the present will challenge the last revolutionary regimes in a de facto generational conflict (and this didn’t exactly happen). The political principles of the revolutionary republics of the Enlightenment came to represent the next great political paradigm, which is today the unquestioned legitimacy of popular sovereignty. All the royal houses that were spooked by the revolutions in the British colonies, France, and Haiti were eventually either themselves deposed or eased into a graceful retirement as powerless constitutional monarchs. So they were right to be spooked, but the mechanisms by which their countries were transformed into democratic republics were many and various, so it was not revolution per se that these regimes needed to fear, but the implacable progress of an idea whose time had come. 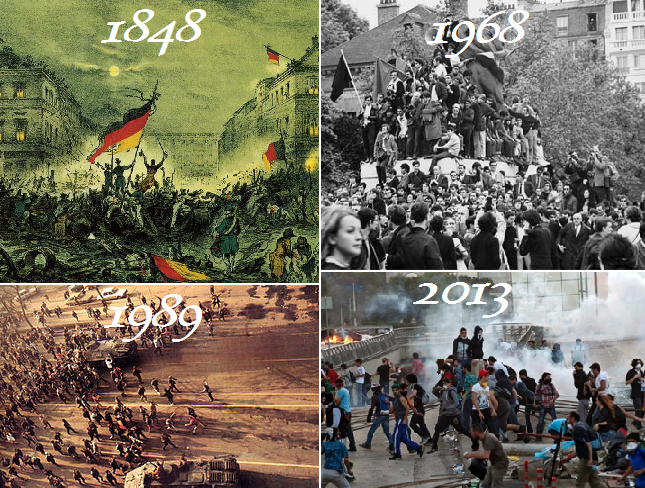 Like 1968 and 1989, 2013 is looking a little like the original “Springtime of Nations” in 1848, when popular rebellions against entrenched power spontaneously emerged in widely divergent societies. While the energies released in these revolutionary movements proved to be too scattered to form the basis of a new political order that could replace the established political order — and far short of the ideal Novus ordo seclorum imagined by Virgil — the high political drama of such events leaves an impression that should not be denied or trivialized. It is the historical exception that the American Revolution, the French Revolution, and the Bolshevik Revolution resulted in far-reaching political changes that shaped the future of the planet entire. 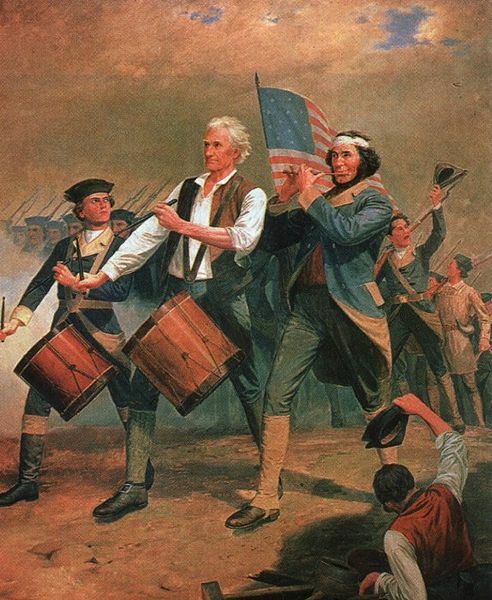 The first of these, the American Revolution that we celebrate today, far from being a mere ephemeral moment like the protests of today, established a political institution that was to dominate the planet, requiring less than two centuries to grow into the sole superpower in the world. Few Revolutions can boast of such an issue, but whether we want to celebrate the prescience of the Founding Fathers in pursing the expedient of regime change through political revolution and armed struggle, or whether we see this as the opening of Pandora’s Box is another matter. There is a lot going on in this passage. Its vision of a society that continually transcends itself through revolution is an explicit negation of Comte de Maistre’s finitistic political theory, which shows both Sartre and de Maistre in their true political colors: Sartre as a revolutionary, and de Maistre as a reactionary. This passage also formulates a social and collective expression of what in Gibbon, Sartre, and the Eurozone I called Sartre’s Principle of Inalienable Autonomy for Individuals, or, more briefly, Sartre’s Principle. I contrasted Sartre’s principle as an individualistic principle to Gibbon’s principle — namely, that no assembly of legislators can bind their successors invested with powers equal to their own — which is a collective or political principle. But now I see that I could have dispensed with Gibbon and formulated the principle both in its individualistic and collectivistic forms with reference only to Sartre. In Gibbon, Sartre, and the Eurozone I argued that the individual principle, Sartre’s Principle, was ultimately the foundation of the freedom of societies and social wholes; in other worlds, social freedom supervenes upon individual freedom. The nearly unique value placed upon individual liberty in the American revolution is significant here: this was a revolution that was successful because it recognized the supervenience of social liberty upon individual liberty. The French and Bolshevik revolutions gave way to terrors and atrocities because their vision was of a Rousseauian majoritarianism in which the individual was to be “forced to be free.” That didn’t turn out to well. Many of those protesting and marching and rebelling today also believe in the possibility of society transcending itself to another order, even if they cannot precisely imagine what that order will be; these efforts are likely to be successful only in so far as they respect individual liberty as the foundation of social liberty. To the extent that this grounding of liberty in the individual is denied — indeed, in so far as it is denied in the US today by fashionable anti-individualists — these efforts will fail to bear fruit.